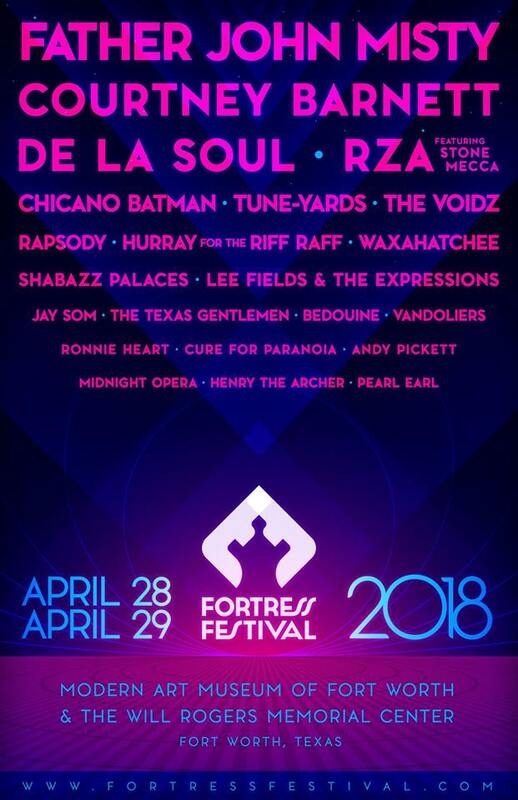 The full music lineup for Fortress Festival, set to take place this April 28 & 29 in Fort Worth’s Cultural District including Father John Misty, Courtney Barnett, Tune-Yards, De La Soul, the RZA, Shabazz Palaces, Lee Fields and the Expressions, and Waxahatchee. Weekend general admission and VIP passes are available now for purchase at www.FortressFestival.com/tickets. In partnership with the Modern Art Museum of Fort Worth, Fortress Festival offers both local residents and music lovers from across the country a n two-day event celebrating music and culture. The festival welcomes to North Texas internationally-acclaimed headliners alongside some of today's hottest up-and-coming music acts, as well as a variety of local artists and boundary-testing musical pioneers. Festival-goers are offered a unique opportunity to explore the Museum's galleries during regular and extended gallery hours throughout the weekend. For more information and package details, visit www.FortressFestival.com/tickets.